What did you think of Identifying the Correct Article for a Word Part 1 ? 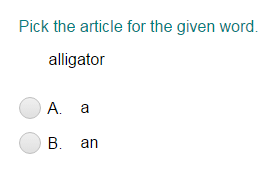 The words “a, an, and the” are articles. They come at the beginning of a noun phrase. A and an are used when talking about something unspecific. Use a before words starting with consonant sound. Use an before words starting with vowel sound. The is used when talking about something specific.